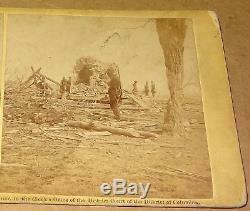 Original stereoviews titled: Ruins of Mrs. Henry's House Bull Run. Entered according to the Act of Congress in the year 1862 by Alex Gardner. From the series Photographic Incidents of the War. Mild crease to bottom right corner. The item "Bull Run Ruins Mrs Henrys House Civil War Stereoview Barnard 1862 Gardner" is in sale since Monday, January 28, 2019. This item is in the category "Collectibles\Photographic Images\Vintage & Antique (Pre-1940)\Stereoviews". The seller is "kronos12344kxt" and is located in Jefferson, Ohio. This item can be shipped to United States, Canada, United Kingdom, Mexico.